The 40-40 Club is a term coined by sportswriters to distinguish Major League Baseball players who accumulate a total of both 40 home runs and 40 stolen bases in a single season. 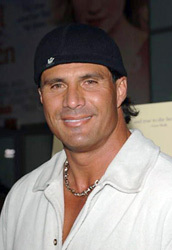 The relative recentness of the 40/40 phenomenon (first achieved by Jose Canseco in 1988) speaks volumes about the exceptional combination of power (thunder) and speed (lighting) required to maintain such a steady offensive attack throughout the course of a season. Players who possess the power to hit 40 home runs and the speed to steal 40 bases in the same season at the professional level are rare...so it is only fitting that two-of-the-four MLB players who have ever achieved this are also members of The 500 Home Run Club. 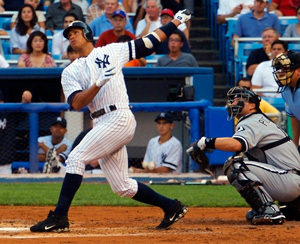 Alex Rodriguez, Barry Bonds, and the other two members of the 40/40 Club “broke the mold” by terrorizing opposing pitchers as they unleashed the power of lighting at the plate, and unnerving the pitcher by posing a constant threat to steal a base. Baseball history is full of players who had tremendous bat- and foot-speed, such as Mickey Mantle, Willie Mays and Jackie Robinson; yet it took over 100 years for anyone to achieve this Herculean and Hurrying feat. This is due, in part, to the different style of play “in vogue” at various times. For instance, stolen base totals in the 1980s were unusually high, as managers implemented “small ball” tactics in an effort to run over their opponents. Home run totals have risen in the past decade, while stolen bases became more rare as managers are less apt to “send” base runners with their long-ball oriented batters at the plate. The first player to approach the 40/40 mark was Ken Williams in 1922, with 39 home runs and 37 stolen bases, making him the first player to reach the 30-30 club. It would take another 30 years for anyone to approach the mark, as Willie Mays did in 1957 with 36 home runs and 40 stolen bases. Barry Bonds’ father Bobby Bonds was one home run away from becoming the founding member of the club in 1973 with 39 home runs and 43 stolen bases, and Eric Davis had a near-miss in 1987 when he stole 50 bases and hit 37 home runs (in only 129 games). Darryl Strawberry also fell just shy of the dual landmark that same year when he clubbed 39 home runs and had 36 stolen bases in 154 games. More recently, the 40-40 Club nearly gained two new members in the same year. In 2002, Vladimir Guerrero of the Montreal Expos and Alfonso Soriano of the New York Yankees were each just one home run short, with 39 homers each and 40 and 41 stolen bases, respectively. In 2004, Carlos Beltran was two home runs shy as he hit 38 and collected 43 steals. 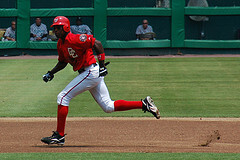 Soriano finally achieved the 40/40 plateau on Saturday, September 16, 2006, when he swiped his 40th stolen base of the season with a fleet footed theft of second base against the Brewers at RFK Stadium in Washington…to go with his 40+ home run tally. He went on to hit 46 home runs and steal 41 bases with the Washington Nationals (where he was coached by 500 HR Club alum Frank Robinson). “I’m proud of myself that I did 40-40…[the fact that he was only the 4th player in MLB history to hit 40 homers and steal 40 bases] very amazing for me, because there's a lot of players that can play this game,” said Alfonso Soriano. “When I slid, I saw the fans screaming. When I was safe, I said, 'I did it.' I'm so happy. I was thinking about my family. I'm glad they could see me do 40-40." 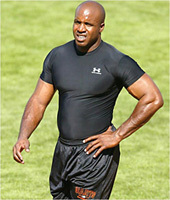 Six days later, on September 22, he became the first person ever to reach 40 home runs, 40 stolen bases and 40 doubles in one season, making him the only member of the 40-40-40 Club. Since the 50-home run season became more common in the late 1990s and early 21st century — variously due to improvements in physical training, smaller field dimensions, — the first part of the 50-50 plateau may be more easily attained. At the same time, stolen base totals are down league wide. As with most 30-30 and 40-40 seasons, a player would have to remain nearly injury-free during the year. Rapper Jay-Z named his NYC sports bar, The 40/40 Club. Rodriguez is the only non-outfielder to have gone 40-40 (Soriano, once a second baseman, played left field in his 40-40 season). Soriano's 2006 season had 46 home runs, 41 stolen bases, and 41 doubles, thus making him the sole member of the 40-40-40 club. He is also the only member to record 20 outfield assists in the same season.